Vegeta is the son King Vegeta. King Vegeta and all Saiya-jins except 4 were killed by Freezer. However, Freezer decided to keep Vegeta alive and have him work for his Planet Trade. 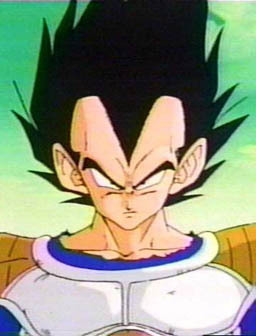 Vegeta is very arrogant and proud, and does not like having someone stronger than him around. Vegeta's partners are Nappa and Raditz. After hearing the news of Raditz's death and about the Dragon Balls, Vegeta and Nappa head for the planet Earth. Vegeta has Nappa fight the Z-Senshi, but when Nappa is defeated, Vegeta kills him. Vegeta and Goku fight, and Vegeta is defeated with help from Kuririn, Gohan, and Yajirobi (Yajirobi cut off Vegeta's tail). Vegeta goes to recover on one of Freezer's planets. There Vegeta learns of Freezer's plan to use the Namek Dragon Balls to gain immortality. Vegeta goes to Namek to stop Freezer, and wish for immortality for himself. Vegeta manages to kill Dodoria and Zarbon. However, Vegeta is forced to team up with Gohan and Kuririn when the Ginyu Force arrives. The Ginyu Force defeats them but Goku comes in and defeats the Ginyu Force. Vegeta kills Guldo, Recoome, and Burter. Then later kills Jeice. However, Vegeta is killed in the fight against Freezer. Luckily for Vegeta, he returns to life because of the Dragon Balls wish. Vegeta now wants to be better than Goku, and Vegeta reaches Super Saiya-jin. Vegeta kills Android 19, but is defeated by Android 18. Vegeta then goes with his son Mirai Trunks to train in the Room Of Spirit And Time. Vegeta defeats Cell form 2, but is defeated when Cell becomes Perfect Cell. However, Vegeta helps make up for his mistake of letting Cell become perfect when he helps Gohan kill Perfect Cell. Vegeta becomes Majin Vegeta in the Buu saga, in order to beat Goku, but Vegeta self-destructs to attempt to kill Majin Buu, which doesn't work. Vegeta is granted a second chance by King Enma to help fight Buu. Vegeta constructs a plan to kill Buu, and with help from Mr. Satan, Goku is able to kill Buu. Vegeta finally turns completely over to the good side. With help from Bulma, Vegeta goes Super Saiya-jin 4 in Dragon Ball GT. 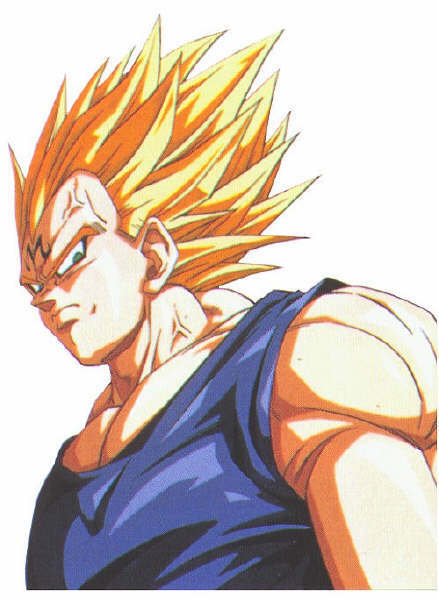 Vegeta's main attacks are, The Gallic Gun, Final Flash, and Big Bang Attack. Vegeta's wife is Bulma and they have two children. A son named Trunks. And a daughter named Bra.